We've got the best cupcakes in NYC in our neighborhood. They are just delightful, and they're inexpensive too. Your cupcake tour is not complete without a visit to Tonnie's Cupcakes. 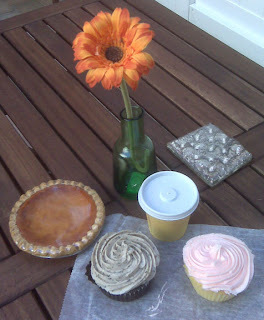 From left to right we had the Sweet Potato Pie, the Cappuccino cupcake, and a Strawberry Vanilla cupcake. The little cup had an espresso to wash it all down.